Disclaimer: I was provided with products to give you my honest opinions and your views may differ, thank you! 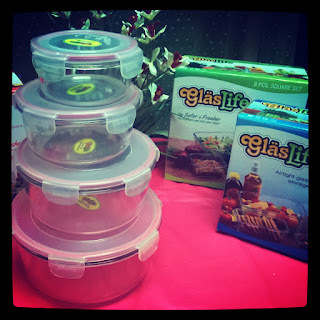 Here are Tribest GlasLife glass airtight containers, which replace all of your plastics and Tupperware that would otherwise have a shorter life and perhaps be less effective at storing your food! These are unique in that they are glass that is oven safe, so you can cook with them (without the lid) and then when they've cooled down, you can put the lid on top for storage and then place in the fridge after - no messing about with transferring food or juggling containers. These are also dishwasher safe and so, when you've used up whatever you were storing in them, just place them in the dishwasher and you'll be good to go! Pictured are the round variety of Tribest's GlasLife containers, but they also have them in square and rectangle sets and would make great gifts for the home this Christmas! They would also be great for taking potlucks to parties over the season, or to use to store all that food from your holiday feast! I have used mine to store flour and sugar, to keep food fresh in the fridge and to store candy on the table if we have any visitors who like to snack and then the bigger containers are great for cooking and presenting food from oven, to table, to fridge! Check out Tribest's GlasLife glass airtight containers by visiting their website! You can also find them on Twitter and other social media outlets. Follow Mom's Gone Bronson's Holiday Gift Guide with #mgbhgg and at the above tab! Let me know what you think, in the comments, below! Ozeri Scale, Just In Time For New Year! YouTheory For Optimal Health in The New Year!